We very much regret that it is necessary to limit the numbers attending the Conferring ceremony in the Conferring Hall to 2 guests per person conferred. (Guests will only be admitted to the Conferring Hall with a ticket). An overflow seating area is available where additional guests can watch the ceremony via a video-link. A park and ride facility will be in place on the day from Carraroe Retail Park as parking is limited in the vicinity of the hotel. A shuttle bus service from Carraroe Retail Park to the Sligo Park Hotel will run from 10 a/m - 7p/m. Robes may be collected between 8.30 a.m. and 11.15 a.m., from the Hazelwood Room on the day. 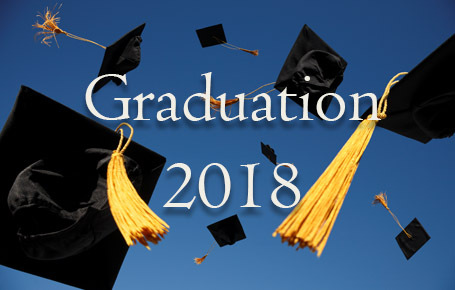 Robed Graduands must be in attendance at the conferring hall (Sligo Park Suite) at the Sligo Park Hotel, no later than 11.15 a.m. for the noon ceremony. Graduands must check the seating plan at the entrance to the conferring hall prior to the ceremony and ensure that they are in the correct allocated seat. Guests are required to take their seats in the Conferring Hall as early as possible, at least 30 minutes before commencement of the Ceremony. Light refreshments will be served after the conferring ceremonies in the lobby and area outside the Sligo Park Suite. “The Sligo Champion” are the official photographers for graduation. There will be two photographers located near the gym area of the hotel on graduation day. Photographers will be on site from 8.30 a.m. and Graduands are encouraged to have their photographs taken early, ideally before the graduation ceremony, in order to avoid delays. Please note the photographers will not take photos between 11.15 a.m. - 12.00 for those being conferred at the noon ceremony. A framing service will be provided by Image Framers Sligo in the hotel lobby. Please note that photos taken on the day may be used for promotional purposes.